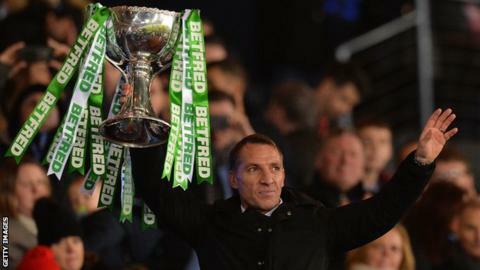 Brendan Rodgers' move to Leicester City from Celtic - Scottish treble winners twice in succession and a club of global stature - will be considered a coup by the Premier League club's hierarchy. Rodgers has rebuilt his managerial reputation north of the border after his sacking at Liverpool in 2015, and Leicester are backing him to lead their revival after the sacking of Claude Puel. So what are Rodgers' main tasks at the King Power Stadium - and what is motivating him to leave Celtic with another domestic treble in his sights and the campaign reaching its climax? Is this redemption time for Rodgers? Rodgers left Liverpool in October 2015, and later revealed he was hospitalised shortly afterwards following what he described as his body tightening up from the tension of the conclusion of his time at Anfield. Rodgers, who had signed a four-year contract only 18 months earlier, was left hugely disappointed by his departure not much more than a year after he was within a Steven Gerrard stumble of being the first manager to bring the title back to Anfield in 24 years. It would have put Rodgers in Anfield folklore - just think of the accolades his successor Jurgen Klopp would receive should he achieve that feat this season - but instead it was his high water mark. Talisman Luis Suarez left for Barcelona, Liverpool's transfer policy went badly awry with the arrival of misfits such as Mario Balotelli and Lazar Markovic, a subsequent Champions League campaign never got beyond the group stage and a dull 1-1 draw at Everton signalled the end. Rodgers brought Mario Balotelli to Liverpool for £16m in August 2014 but the striker described his relationship with his former manager as a "disaster"
In some respects, that segment of history had been unkind to Rodgers as his Liverpool team did, on many occasions, play thrilling football. But it unravelled from the moment that 2013-14 campaign came to its fateful conclusion. There must always have been the temptation to go back to unfinished business in the Premier League, demonstrate his development among the elite once more and show he is still the man who was praised as a tactical innovator and bright, modern young manager at Swansea City, earning his ticket to Anfield. He is not at the stage where he would be seriously considered for a top-six job - so as shots at Premier League redemption go, this is a great chance to prove his worth once more. Rodgers has always been a manager who wants to spend his time out on the grass with players, developing them technically and tactically into the attractive, attacking force he wishes to have as his trademark. At 46, he has no desire to be chained to his desk. Leicester's owners clearly felt Puel was not getting the maximum out of the talent assembled, with big results such as wins against Manchester City and Chelsea hinting at what could be achieved, only to be undermined by the sort of sequence such as seven defeats in nine games that got him the sack. Rodgers will relish working with the likes of 22-year-old England left-back Ben Chilwell, creative midfielder James Maddison, the exciting Demarai Gray, and the emerging Hamza Choudhury and Harvey Barnes. The Foxes owners are demanding, as the dismissals of title winner Claudio Ranieri, Craig Shakespeare and now Puel illustrate, but they are also financially supportive. Leicester may have raked in £60m from Manchester City for Riyad Mahrez last summer but it was fully re-invested in the squad and Rodgers will not want for support in the transfer market. Initially, however, his task will be to reinvigorate and revive a collection of players who should be doing better than 12th place in the Premier League. One of the complaints about Puel was that he was not employing the style that suited Leicester, which is code for the counter-attacking approach that - despite pre-season odds of 5,000-1 - won them the Premier League in 2015-16. That is all very well, but there is an element of fantasy about it - it was three years ago, and a campaign that will never be repeated. Time and players move on. Rodgers must instantly stamp his style and authority on Leicester's powerful dressing room. He wants a high-paced, possession-based pressing strategy but it is also a passing style. He is wise enough to find an approach that suits the squad he has inherited but the tail cannot wag the dog. Vardy's role in Leicester's successes is still a huge area for debate, and his relationship with Puel was always under the microscope. The striker's pace and threat is still vital but he is 32 and will not be around forever. Rodgers must explore all options and be backed when doing so. Yes, it is understandable Leicester's players and fans want to hark back to how the title was won but Rodgers must decide on his style and stick with it. If the players do not like it they should be moved on, because someone must put a foot in the revolving door marked "manager" at the King Power Stadium. Puel was not only finished off by results - he was not helped by his own understated, downbeat personality that never resonated with supporters or players. He was not expected to become a circus act (and why should he try to become something he was not?) but his quiet manner failed to excite, inspire or create and impression of strong leadership. It is not a defining quality, but the stream of stories about poor communication and questions about Puel's methods, team selection and tactics only add to the impression of a club going stale. Rodgers, with the ready smile and ability to speak the sort of upbeat language fans and players like to hear, will be cast as the 'anti-Claude'. He is an advocate of attractive football, exuding positivity and will find a passionate support in an atmospheric stadium ready and willing to embrace that. No-one seriously expects Leicester to repeat the deeds of 2015-16, or even challenge for Champions League football, but this is a big opportunity for the club and Rodgers to make it the best of the rest. The top six looks set in stone, for now at least, but there is no reason why Rodgers cannot have Leicester fighting the likes of Watford, Wolves, West Ham, Bournemouth and Everton for the upper reaches of the top 10. It bears repeating again. He almost won the title at Liverpool, and when this is qualified by pointing out he had Suarez as his inspirational spearhead it should be pointed out he also managed the maverick Uruguayan superbly to get that golden season out of him. Rodgers clearly sees the possibilities in his request to speak to Leicester - if he can achieve those targets, a reputation that took a dent in the Premier League context from his latter days at Liverpool will receive some serious restoration.